You don’t have to request a new quote for every Clipping Path India order. 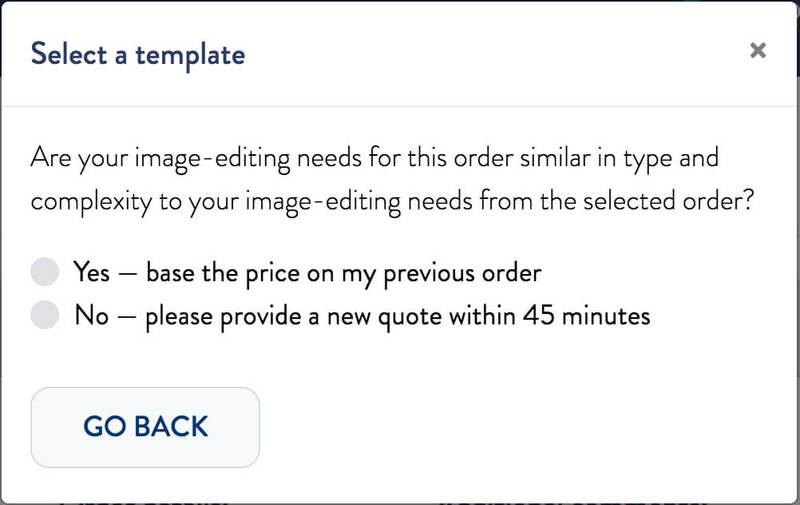 If you have similar image-editing needs to a previous order, you can use that order to immediately place a new order without going through the quote process. First, you’ll need to create an order template (if you haven’t already). If you already have an order template, you can go to MY ORDERS and click the START A NEW ORDER button in the upper-right corner. The window will show your saved templates. Click SELECT for the corresponding template. Then confirm you can use a template: Select Yes — base the price on my previous order and click CONTINUE. You will be taken to the new order customization screen. Depending on your deadlines, you can adjust the turnaround time for receiving your edited images back. Look for When do you need the edited images back? and select the option that will work for you. You can choose from as little as six hours to more than three days. Changing the turnaround time for your edited images will also affect the price. The longer you give us, the lesser your investment. We’ve also added handy percentages that show you just how much the price will change. Click inside the form or use the arrows to choose the appropriate number. Tip: Remember that you’ll need to submit a separate quote if you have additional images with different editing needs. Tip: You can create multiple templates based on a previous order with different settings, so that you can place order quickly using the right template without having to change those settings every time. After you’ve made sure all the settings are correct, click the ADD TO CART button in the lower right corner. Then complete your order. What is a template and how does it work?